For the first quarter of 2010, the banking industry generated $170 billion of revenue. A year later, through the tireless efforts of more than a million bankers, the industry generated $165 billion of revenue, a 3% drop. Listen to any bank stock analyst today and they will emphasize their concerns about future revenue growth in the banking industry. With flat to shrinking loan demand, regulatory assaults on non-interest income and declining mortgage banking volumes, running a bank feels a bit like flying a balloon with a leak in it – not a fun ride! In the past three years bank loan portfolios are down about 10% or $800 billion. At a 2% spread over the current cash/investment return, that’s more than $15 billion in revenue and more a hit than the Durbin Amendment is likely to cost. The headlines in the past weeks have confirmed for bankers that no macro events are likely to help all balloons rise in the near future. It’s a brutal game of patching holes, pumping air with our lungs and steering clear of the trees. As bankers begin their budgeting cycles for 2012, there is certain to be an anxious CFO or two pushing hard for revenue growth to exceed rising expenses from regulation and catching on technology initiatives. While this year’s budget will certainly be one major Excel spreadsheet that’s hard to balance, one message needs to be clear in this year’s budget cycle. There is not one major magic air pump that gets the revenue balloon floating again. It’s going to take a lot of pumping from every business unit, branch and relationship manager. Executives developing their 2012 and beyond financial plans should be working to drill down how these components will help contribute to renewed revenue growth. Transparency Rules. Bankers can start the revenue growth challenge with a simple exercise. Ask managers on the team to quote the annual revenue of the company. You will be shocked how many cannot guestimate within 10% of the actual number. They can quote total assets and branches, but struggle with revenue (defined by bank stock analysts as net interest income plus non-interest income not including loan losses). One of the first steps for executive is to make both total revenue and total revenue goals visible in the organization. From there management should begin to drill down the total revenue pie into its major components. Line of business managers need to understand their revenue contribution even if it requires a bit of transfer pricing here or there. Translating outstanding loans/deposits and production volume into revenue helps change the language in the organization for the better. If your funds transfer pricing system and cost accounting system is referred to as MS Excel or Abacus 1.0, it might be time to upgrade since transparency around revenue and profit contribution will be critical in a slow-growth industry. Don’t Fear the Big Reaper. For 99% of the banks in America, growth is still an opportunity in the form of market share grabs from the too-big-to-fail banks. It’s about stickin’ it to the Man. Hittin’ the Death Star where it hurts. Pulling the elephant’s tail. Choose your metaphor. Whether it’s commercial, retail or mortgage lending, the sheer size of market share held by the nationals still provides compelling opportunity for GonzoBankers. I recently had a client initiate a “Break the Bank” campaign that got the entire organization aligned around stealing checking and consumer loan share. Sounds simple, but the campaign hit its goals and provided double-digit revenue growth for the institution. Focus the Cross-Sell Mantra. Cross-selling may feel a bit tired to bankers who plan on attending their 13th BAI conference this fall, but it’s important to remember that leaders like Wells Fargo and TD view cross-sell as the key way to grow revenue in a flat economy. For GonzoBankers, mindless cajoling of the front-line to cross-sell doesn’t work anymore. Instead, executives should be prioritizing key cross-sell “intersection” points (e.g., credit cards to checking customers Post Durbin, mortgage refi to high FICO depositors, 401(k) to business customers) and then providing the training, marketing and goal-setting in a punctuated way to give these efforts a launching pad. This is different than “campaign of the month.” It’s looking for true points of leverage in your cross-sell efforts. Go Deep with Niches. We have written several times on GonzoBanker about the value of developing product or customer segment niches to help protect both margins and revenue growth rates. (Check out Earnings Pressures? It’s Time To Niche.) The message is alive and well. While banking industry revenues were down 3% for the first quarter, USAA’s revenue was up 7%, City National Bank’s revenue was up 8%, and Silicon Valley Bank’s revenue was up an impressive 21%. The value of niche is still real. The Price is Right. One of the silver linings of our three-year downturn has been that banks have begun to re-engage with the idea that we bankers should get compensated for taking risk and that gaining share at the expense of margin only creates pain down the road. In the past three years, banks have added 30bp of net interest margin, primarily aided by sinking deposit funding costs but also by a bit more spread in loan yield. Today, most banks still are a bit gun shy in areas such as loan fees, retail fees and pricing on quality commercial real estate deals. What tends to happen is that lost deals create internal sound bites that we are “pricing ourselves” out of the market, when losing deals is simply part of a disciplined culture. To remind ourselves of the value of cultural pricing discipline, just remember the net interest margin of Wells Fargo runs at 4.21%, more than 50bp above the industry at its massive size. This discipline has been a key contributor to Wells Fargo’s stock performance for decades. What’s the total revenue of our company? What are the major drivers and how are we lining up accountability and assumptions for revenue growth across all business lines and products? Where do we have the most opportunity to steal share from the large banks? Who is weak and in what markets and how are we lining up our sales, marketing and underwriting resources to steal share? How strong is our market intelligence at this point about where opportunity exists? What are our bank’s cross-sell priorities and have we quantified how much revenue is generated by meeting our cross-sell goals? Do we have the right product knowledge, training and sales support to execute on our cross-sell priorities? What niches do we have at our bank? Are they growing? What could we do strategically to grow existing niches or add new niches? How consistent has our loan pricing been across officers and geographies? What is our most recent retail fee study telling us we should do to enhance income but retain our market position? Are we getting our fair share of loan fees or is our culture still holding back from the more frothy days of loan growth? It’s time to drill down on sources and opportunities for revenue generation, GonzoBankers. The balloon is spitting helium and headed toward the power lines. Let’s all start pumping. At Cornerstone Advisors, we’ve seen how opportunities for revenue growth battle expense reduction for top consideration in a financial institution’s long-term goals and objectives. We’ve assisted hundreds of banks and credit unions tackle this challenge in their strategic planning efforts. 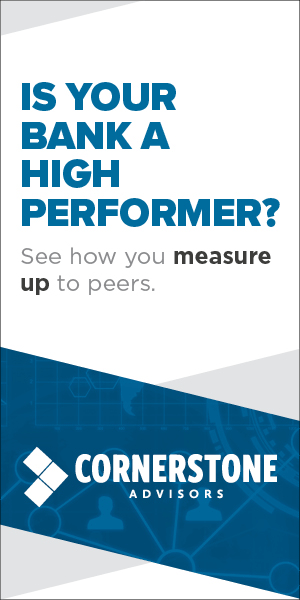 Continued measurement through performance scorecards. Contact us today. Together we’ll start drilling down on sources and opportunities for revenue generation.